June in Buffalo is a festival of exploration and activity where fans of contemporary music may satisfy their desires for good performances of same. Morton Feldman is a known quantity. He used to be the focal point of the festival — today David Felder runs it. It has been going on for twenty-five years now and the musical results are impressive. 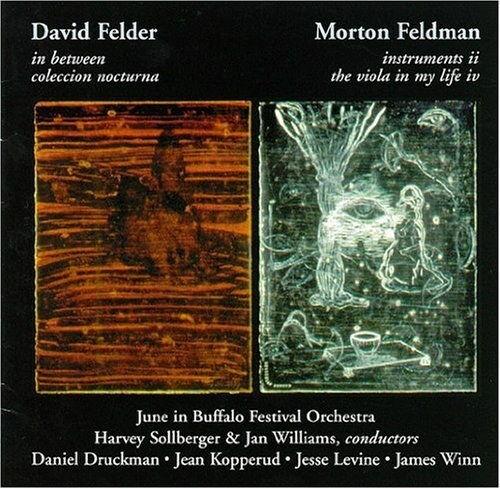 Felder's music is as manic and dense as Feldman's is meditative and sparse, yet they have a certain point in common and make a good contrast with each other. Feldman's viola piece played with polish by Levine is not the work previously recorded by Karen Tuttle; hence the different number. This is all large scale orchestral music although it doesn't make conventional orchestral sounds, ranging from chamber music through to improvisatory-like textures. The sound is full bodied and the playing is effective.